"Turntable" redirects here. For its use as a musical instrument, see Turntablism. For other uses, see Turntable (disambiguation). Not to be confused with Phonogram. The phonograph is a device for the mechanical recording and reproduction of sound. In its later forms, it is also called a gramophone (as a trademark since 1887, as a generic name in the UK since 1910) or, since the 1940s, a record player. The sound vibration waveforms are recorded as corresponding physical deviations of a spiral groove engraved, etched, incised, or impressed into the surface of a rotating cylinder or disc, called a "record". To recreate the sound, the surface is similarly rotated while a playback stylus traces the groove and is therefore vibrated by it, very faintly reproducing the recorded sound. In early acoustic phonographs, the stylus vibrated a diaphragm which produced sound waves which were coupled to the open air through a flaring horn, or directly to the listener's ears through stethoscope-type earphones. The phonograph was invented in 1877 by Thomas Edison. While other inventors had produced devices that could record sounds, Edison's phonograph was the first to be able to reproduce the recorded sound. His phonograph originally recorded sound onto a tinfoil sheet wrapped around a rotating cylinder. A stylus responding to sound vibrations produced an up and down or hill-and-dale groove in the foil. Alexander Graham Bell's Volta Laboratory made several improvements in the 1880s and introduced the graphophone, including the use of wax-coated cardboard cylinders and a cutting stylus that moved from side to side in a zigzag groove around the record. In the 1890s, Emile Berliner initiated the transition from phonograph cylinders to flat discs with a spiral groove running from the periphery to near the center, coining the term gramophone for disc record players, which is predominantly used in many languages. Later improvements through the years included modifications to the turntable and its drive system, the stylus or needle, and the sound and equalization systems. The disc phonograph record was the dominant audio recording format throughout most of the 20th century. In the 1980s, phonograph use on a standard record player declined sharply due to the rise of the cassette tape, compact disc, and other digital recording formats. However, records are still a favorite format for some audiophiles, DJs and turntablists (particularly in hip hop and electronic dance music), and have undergone a revival in the 2010s. The original recordings of musicians, which may have been recorded on tape or digital methods, are sometimes re-issued on vinyl. Usage of terminology is not uniform across the English-speaking world (see below). In more modern usage, the playback device is often called a "turntable", "record player", or "record changer". When used in conjunction with a mixer as part of a DJ setup, turntables are often colloquially called "decks". In later electric phonographs (more often known since the 1940s as record players or, most recently, turntables), the motions of the stylus are converted into an analogous electrical signal by a transducer, then converted back into sound by a loudspeaker. The term phonograph ("sound writing") was derived from the Greek words φωνή (phonē, "sound" or "voice") and γραφή (graphē, "writing"). The similar related terms gramophone (from the Greek γράμμα gramma "letter" and φωνή phōnē "voice") and graphophone have similar root meanings. 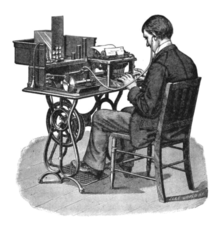 The roots were already familiar from existing 19th-century words such as photograph ("light writing"), telegraph ("distant writing"), and telephone ("distant sound"). The new term may have been influenced by the existing words phonographic and phonography, which referred to a system of phonetic shorthand; in 1852 The New York Times carried an advertisement for "Professor Webster's phonographic class", and in 1859 the New York State Teachers Association tabled a motion to "employ a phonographic recorder" to record its meetings. Arguably, any device used to record sound or reproduce recorded sound could be called a type of "phonograph", but in common practice the word has come to mean historic technologies of sound recording, involving audio-frequency modulations of a physical trace or groove. In the late-19th and early-20th centuries, "Phonograph", "Gramophone", "Graphophone", "Zonophone", and the like were still brand names specific to various makers of sometimes very different (i.e. cylinder and disc) machines; so considerable use was made of the generic term "talking machine", especially in print. "Talking machine" had earlier been used to refer to complicated devices which produced a crude imitation of speech, by simulating the workings of the vocal cords, tongue, and lips – a potential source of confusion both then and now. In British English, "gramophone" may refer to any sound-reproducing machine using disc records, which were introduced and popularized in the UK by the Gramophone Company. Originally, "gramophone" was a proprietary trademark of that company and any use of the name by competing makers of disc records was vigorously prosecuted in the courts, but in 1910 an English court decision decreed that it had become a generic term; it has been so used in the UK and most Commonwealth countries ever since. The term "phonograph" was usually restricted to machines that used cylinder records. "Gramophone" generally referred to a wind-up machine. After the introduction of the softer vinyl records, ​33 1⁄3-rpm LPs (long-playing records) and 45-rpm "single" or two-song records, and EPs (extended-play recordings), the common name became "record player" or "turntable". Often the home record player was part of a system that included a radio (radiogram) and, later, might also play audiotape cassettes. From about 1960, such a system began to be described as a "hi-fi" (high-fidelity, monophonic) or a "stereo" (most systems being stereophonic by the mid-1960s). In American English, "phonograph", properly specific to machines made by Edison, was sometimes used in a generic sense as early as the 1890s to include cylinder-playing machines made by others. 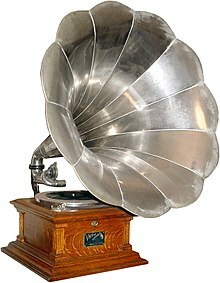 But it was then considered strictly incorrect to apply it to Emile Berliner's upstart Gramophone, a very different machine which played discs. "Talking machine" was the comprehensive generic term, but from about 1902 on, the general public was increasingly applying the word "phonograph" indiscriminately to both cylinder and disc machines and to the records they played. By the time of the First World War, the mass advertising and popularity of the Victrola (a line of disc-playing machines characterized by their concealed horns) sold by the Victor Talking Machine Company was leading to widespread generic use of the word "victrola" for any machine that played discs, which were generally called "phonograph records" or simply "records", but almost never "Victrola records". After electrical disc-playing machines started appearing on the market during the late 1920s, usually combined with a radio receiver, the term "record player" was increasingly favored by users when referring to the device. Manufacturers, however, typically advertised such combinations as "radio-phonographs". Portable record players (no radio included), with a latched cover and an integrated power amplifier and loudspeaker, were fairly common as well, especially in schools and for use by children and teenagers. In the years following the Second World War, as "hi-fi" (high-fidelity, monophonic) and, later, "stereo" (stereophonic) component sound systems slowly evolved from an exotic specialty item into a common feature of American homes, the description of the record-spinning component as a "record changer" (which could automatically play through a stacked series of discs) or a "turntable" (which could hold only one disc at a time) entered common usage. By the 1970s, the use of a "record changer", which might damage the stacked discs, was widely disparaged. So, the "turntable" emerged triumphant and retained its position to the end of the 20th century and beyond. Through all these changes, however, the discs have continued to be known as "phonograph records" or, much more commonly, simply as "records". 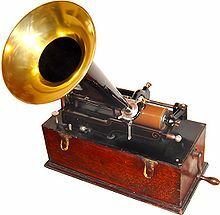 Gramophone, as a brand name, was not used in the United States after 1902, and the word quickly fell out of use there, although it has survived in its nickname form, Grammy, as the name of the Grammy Awards. The Grammy trophy itself is a small rendering of a gramophone, resembling a Victor disc machine with a taper arm. Modern amplifier-component manufacturers continue to label the input jack which accepts the output from a modern magnetic pickup cartridge as the "phono" input, abbreviated from "phonograph". 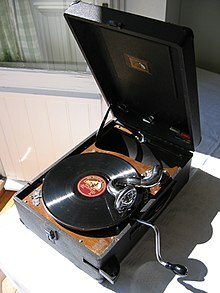 In Australian English, "record player" was the term; "turntable" was a more technical term; "gramophone" was restricted to the old mechanical (i.e., wind-up) players; and "phonograph" was used as in British English. 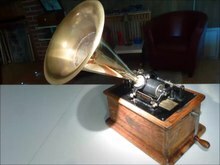 Several inventors devised machines to record sound prior to Thomas Edison's phonograph, Edison being the first to invent a device that could both record and reproduce sound. The phonograph's predecessors include Édouard-Léon Scott de Martinville's phonautograph, and Charles Cros's paleophone. Recordings made with the phonautograph were intended to be visual representations of the sound, but were never sonically reproduced until 2008. Cros's paleophone was intended to both record and reproduce sound but had not been developed beyond a basic concept at the time of Edison's successful demonstration of the Phonograph in 1877. Dictionary illustration of a phonautograph. This version uses a barrel made of plaster of Paris. Direct tracings of the vibrations of sound-producing objects such as tuning forks had been made by English physician Thomas Young in 1807, but the first known device for recording airborne speech, music and other sounds is the phonautograph, patented in 1857 by French typesetter and inventor Édouard-Léon Scott de Martinville. In this device, sound waves travelling through the air vibrated a parchment diaphragm which was linked to a bristle, and the bristle traced a line through a thin coating of soot on a sheet of paper wrapped around a rotating cylinder. The sound vibrations were recorded as undulations or other irregularities in the traced line. Scott's phonautograph was intended purely for the visual study and analysis of the tracings. Reproduction of the recorded sound was not possible with the original phonautograph. In 2008, phonautograph recordings made by Scott were played back as sound by American audio historians, who used optical scanning and computer processing to convert the traced waveforms into digital audio files. These recordings, made circa 1860, include fragments of two French songs and a recitation in Italian. Charles Cros, a French poet and amateur scientist, is the first person known to have made the conceptual leap from recording sound as a traced line to the theoretical possibility of reproducing the sound from the tracing and then to devising a definite method for accomplishing the reproduction. On April 30, 1877, he deposited a sealed envelope containing a summary of his ideas with the French Academy of Sciences, a standard procedure used by scientists and inventors to establish priority of conception of unpublished ideas in the event of any later dispute. Cros proposed the use of photoengraving, a process already in use to make metal printing plates from line drawings, to convert an insubstantial phonautograph tracing in soot into a groove or ridge on a metal disc or cylinder. This metal surface would then be given the same motion and speed as the original recording surface. A stylus linked to a diaphragm would be made to ride in the groove or on the ridge so that the stylus would be moved back and forth in accordance with the recorded vibrations. It would transmit these vibrations to the connected diaphragm, and the diaphragm would transmit them to the air, reproducing the original sound. An account of his invention was published on October 10, 1877, by which date Cros had devised a more direct procedure: the recording stylus could scribe its tracing through a thin coating of acid-resistant material on a metal surface and the surface could then be etched in an acid bath, producing the desired groove without the complication of an intermediate photographic procedure. The author of this article called the device a "phonographe", but Cros himself favored the word "paleophone", sometimes rendered in French as "voix du passé" (voice of the past) but more literally meaning "ancient sound", which accorded well with his vision of his invention's potential for creating an archive of sound recordings that would be available to listeners in the distant future. Cros was a poet of meager means, not in a position to pay a machinist to build a working model, and largely content to bequeath his ideas to the public domain free of charge and let others reduce them to practice, but after the earliest reports of Edison's presumably independent invention crossed the Atlantic he had his sealed letter of April 30 opened and read at the December 3, 1877 meeting of the French Academy of Sciences, claiming due scientific credit for priority of conception. Throughout the first decade (1890–1900) of commercial production of the earliest crude disc records, the direct acid-etch method first invented by Cros was used to create the metal master discs, but Cros was not around to claim any credit or to witness the humble beginnings of the eventually rich phonographic library he had foreseen. He had died in 1888 at the age of 45. Thomas Alva Edison conceived the principle of recording and reproducing sound between May and July 1877 as a byproduct of his efforts to "play back" recorded telegraph messages and to automate speech sounds for transmission by telephone. His first experiments were with waxed paper. He announced his invention of the first phonograph, a device for recording and replaying sound, on November 21, 1877 (early reports appear in Scientific American and several newspapers in the beginning of November, and an even earlier announcement of Edison working on a 'talking-machine' can be found in the Chicago Daily Tribune on May 9), and he demonstrated the device for the first time on November 29 (it was patented on February 19, 1878 as US Patent 200,521). "In December, 1877, a young man came into the office of the SCIENTIFIC AMERICAN, and placed before the editors a small, simple machine about which very few preliminary remarks were offered. The visitor without any ceremony whatever turned the crank, and to the astonishment of all present the machine said: "Good morning. How do you do? How do you like the phonograph?" The machine thus spoke for itself, and made known the fact that it was the phonograph..."
Edison presented his own account of inventing the phonograph. "I was experimenting," he said, "on an automatic method of recording telegraph messages on a disk of paper laid on a revolving platen, exactly the same as the disk talking-machine of to-day. The platen had a spiral groove on its surface, like the disk. Over this was placed a circular disk of paper; an electromagnet with the embossing point connected to an arm traveled over the disk; and any signals given through the magnets were embossed on the disk of paper. If this disc was removed from the machine and put on a similar machine provided with a contact point, the embossed record would cause the signals to be repeated into another wire. The ordinary speed of telegraphic signals is thirty-five to forty words a minute; but with this machine several hundred words were possible." "From my experiments on the telephone I knew of how to work a pawl connected to the diaphragm; and this engaging a ratchet-wheel served to give continuous rotation to a pulley. This pulley was connected by a cord to a little paper toy representing a man sawing wood. Hence, if one shouted: ' Mary had a little lamb,' etc., the paper man would start sawing wood. I reached the conclusion that if I could record the movements of the diaphragm properly, I could cause such records to reproduce the original movements imparted to the diaphragm by the voice, and thus succeed in recording and reproducing the human voice." "Instead of using a disk I designed a little machine using a cylinder provided with grooves around the surface. Over this was to be placed tinfoil, which easily received and recorded the movements of the diaphragm. A sketch was made, and the piece-work price, $18, was marked on the sketch. I was in the habit of marking the price I would pay on each sketch. If the workman lost, I would pay his regular wages; if he made more than the wages, he kept it. The workman who got the sketch was John Kruesi. I didn't have much faith that it would work, expecting that I might possibly hear a word or so that would give hope of a future for the idea. Kruesi, when he had nearly finished it, asked what it was for. I told him I was going to record talking, and then have the machine talk back. He thought it absurd. However, it was finished, the foil was put on; I then shouted 'Mary had a little lamb', etc. I adjusted the reproducer, and the machine reproduced it perfectly. I was never so taken aback in my life. Everybody was astonished. I was always afraid of things that worked the first time. Long experience proved that there were great drawbacks found generally before they could be got commercial; but here was something there was no doubt of." The music critic Herman Klein attended an early demonstration (1881–2) of a similar machine. On the early phonograph's reproductive capabilities he writes "It sounded to my ear like someone singing about half a mile away, or talking at the other end of a big hall; but the effect was rather pleasant, save for a peculiar nasal quality wholly due to the mechanism, though there was little of the scratching which later was a prominent feature of the flat disc. Recording for that primitive machine was a comparatively simple matter. I had to keep my mouth about six inches away from the horn and remember not to make my voice too loud if I wanted anything approximating to a clear reproduction; that was all. When it was played over to me and I heard my own voice for the first time, one or two friends who were present said that it sounded rather like mine; others declared that they would never have recognised it. I daresay both opinions were correct." Phonograph cabinet built with Edison cement, 1912. The clockwork portion of the phonograph is concealed in the base beneath the statue; the amplifying horn is the shell behind the human figure. Edison's early phonographs recorded onto a thin sheet of metal, normally tinfoil, which was temporarily wrapped around a helically grooved cylinder mounted on a correspondingly threaded rod supported by plain and threaded bearings. While the cylinder was rotated and slowly progressed along its axis, the airborne sound vibrated a diaphragm connected to a stylus that indented the foil into the cylinder's groove, thereby recording the vibrations as "hill-and-dale" variations of the depth of the indentation. Playback was accomplished by exactly repeating the recording procedure, the only difference being that the recorded foil now served to vibrate the stylus, which transmitted its vibrations to the diaphragm and onward into the air as audible sound. Although Edison's very first experimental tinfoil phonograph used separate and somewhat different recording and playback assemblies, in subsequent machines a single diaphragm and stylus served both purposes. One peculiar consequence was that it was possible to overdub additional sound onto a recording being played back. The recording was heavily worn by each playing, and it was nearly impossible to accurately remount a recorded foil after it had been removed from the cylinder. In this form, the only practical use that could be found for the phonograph was as a startling novelty for private amusement at home or public exhibitions for profit. Edison's early patents show that he was aware that sound could be recorded as a spiral on a disc, but Edison concentrated his efforts on cylinders, since the groove on the outside of a rotating cylinder provides a constant velocity to the stylus in the groove, which Edison considered more "scientifically correct". Edison's patent specified that the audio recording be embossed, and it was not until 1886 that vertically modulated engraved recording using wax-coated cylinders was patented by Chichester Bell and Charles Sumner Tainter. They named their version the Graphophone. The use of a flat recording surface instead of a cylindrical one was an obvious alternative which thought-experimenter Charles Cros initially favored and which practical experimenter Thomas Edison and others actually tested in the late 1870s and early 1880s. The oldest surviving example is a copper electrotype of a recording cut into a wax disc in 1881. The commercialization of sound recording technology was initially aimed at use for business correspondence and transcription into writing, in which the cylindrical form offered certain advantages, the storage of large numbers of records seemed unlikely, and the ease of producing multiple copies was not a consideration. In 1887, Emile Berliner patented a variant of the phonograph which he named the Gramophone. Berliner's approach was essentially the same one proposed, but never implemented, by Charles Cros in 1877. The diaphragm was linked to the recording stylus in a way that caused it to vibrate laterally (side to side) as it traced a spiral onto a zinc disc very thinly coated with a compound of beeswax. The zinc disc was then immersed in a bath of chromic acid; this etched a groove into the disc where the stylus had removed the coating, after which the recording could be played. With some later improvements the flat discs of Berliner could be produced in large quantities at much lower cost than the cylinders of Edison's system. In May 1889, in San Francisco, the first "phonograph parlor" opened. It featured a row of coin-operated machines, each supplied with a different wax cylinder record. The customer selected a machine according to the title that it advertised, inserted a nickel, then heard the recording through stethoscope-like listening tubes. By the mid-1890s, most American cities had at least one phonograph parlor. The coin-operated mechanism was invented by Louis T. Glass and William S. Arnold. The cabinet contained an Edison Class M or Class E phonograph. The Class M was powered by a wet-cell glass battery that would spill dangerous acid if it tipped over or broke. The Class E sold for a lower price and ran on 120 V DC. The phenomenon of phonograph parlors peaked in Paris around 1900: in Pathé's luxurious salon, patrons sat in plush upholstered chairs and chose from among many hundreds of available cylinders by using speaking tubes to communicate with attendants on the floor below. Frank Lambert's lead cylinder recording for an experimental talking clock is often identified as the oldest surviving playable sound recording, although the evidence advanced for its early date is controversial. Wax phonograph cylinder recordings of Handel's choral music made on June 29, 1888, at The Crystal Palace in London were thought to be the oldest-known surviving musical recordings, until the recent playback by a group of American historians of a phonautograph recording of Au clair de la lune made on April 9, 1860. The 1860 phonautogram had not until then been played, as it was only a transcription of sound waves into graphic form on paper for visual study. Recently developed optical scanning and image processing techniques have given new life to early recordings by making it possible to play unusually delicate or physically unplayable media without physical contact. A recording made on a sheet of tinfoil at an 1878 demonstration of Edison's phonograph in St. Louis, Missouri has been played back by optical scanning and digital analysis. A few other early tinfoil recordings are known to survive, including a slightly earlier one which is believed to preserve the voice of U.S. President Rutherford B. Hayes, but as of May 2014 they have not yet been scanned. These antique tinfoil recordings, which have typically been stored folded, are too fragile to be played back with a stylus without seriously damaging them. Edison's 1877 tinfoil recording of Mary Had a Little Lamb, not preserved, has been called the first instance of recorded verse. On the occasion of the 50th anniversary of the phonograph, Edison recounted reciting Mary Had a Little Lamb to test his first machine. The 1927 event was filmed by an early sound-on-film newsreel camera, and an audio clip from that film's soundtrack is sometimes mistakenly presented as the original 1877 recording. Wax cylinder recordings made by 19th century media legends such as P. T. Barnum and Shakespearean actor Edwin Booth are amongst the earliest verified recordings by the famous that have survived to the present. Alexander Graham Bell and his two associates took Edison's tinfoil phonograph and modified it considerably to make it reproduce sound from wax instead of tinfoil. They began their work at Bell's Volta Laboratory in Washington, D. C., in 1879, and continued until they were granted basic patents in 1886 for recording in wax. Although Edison had invented the phonograph in 1877 the fame bestowed on him for this invention was not due to its efficiency. Recording with his tinfoil phonograph was too difficult to be practical, as the tinfoil tore easily, and even when the stylus was properly adjusted, its reproduction of sound was distorted, and good for only a few playbacks; nevertheless Edison had hit upon the secret of sound recording. However immediately after his discovery he did not improve it, allegedly because of an agreement to spend the next five years developing the New York City electric light and power system. Meanwhile, Bell, a scientist and experimenter at heart, was looking for new worlds to conquer after his invention of the telephone. According to Sumner Tainter, it was through Gardiner Green Hubbard that Bell took up the phonograph challenge. Bell had married Hubbard's daughter Mabel in 1879 while Hubbard was president of the Edison Speaking Phonograph Co., and his organization, which had purchased the Edison patent, was financially troubled because people did not want to buy a machine which seldom worked well and proved difficult for the average person to operate. In 1879 Hubbard got Bell interested in improving the phonograph, and it was agreed that a laboratory should be set up in Washington. Experiments were also to be conducted on the transmission of sound by light, which resulted in the selenium-celled Photophone. A 'G' (Graham Bell) model Graphophone being played back by a typist after its cylinder had recorded dictation. By 1881, the Volta associates had succeeded in improving an Edison tinfoil machine to some extent. Wax was put in the grooves of the heavy iron cylinder, and no tinfoil was used. Rather than apply for a patent at that time, however, they deposited the machine in a sealed box at the Smithsonian, and specified that it was not to be opened without the consent of two of the three men. The sound vibrations had been indented in the wax which had been applied to the Edison phonograph. The following was the text of one of their recordings: "There are more things in heaven and earth, Horatio, than are dreamed of in your philosophy. I am a Graphophone and my mother was a phonograph." Most of the disc machines designed at the Volta Lab had their disc mounted on vertical turntables. The explanation is that in the early experiments, the turntable, with disc, was mounted on the shop lathe, along with the recording and reproducing heads. Later, when the complete models were built, most of them featured vertical turntables. One interesting exception was a horizontal seven inch turntable. The machine, although made in 1886, was a duplicate of one made earlier but taken to Europe by Chichester Bell. Tainter was granted U.S. Patent 385,886 on July 10, 1888. The playing arm is rigid, except for a pivoted vertical motion of 90 degrees to allow removal of the record or a return to starting position. While recording or playing, the record not only rotated, but moved laterally under the stylus, which thus described a spiral, recording 150 grooves to the inch. The preserved Bell and Tainter records are of both the lateral cut and the Edison-style hill-and-dale (up-and-down) styles. Edison for many years used the "hill-and-dale" method on both his cylinders and Diamond Disc records, and Emile Berliner is credited with the invention of the lateral cut, acid-etched Gramophone record in 1887. The Volta associates, however, had been experimenting with both formats and directions of groove modulation as early as 1881. The basic distinction between the Edison's first phonograph patent and the Bell and Tainter patent of 1886 was the method of recording. Edison's method was to indent the sound waves on a piece of tin foil, while Bell and Tainter's invention called for cutting, or "engraving", the sound waves into a wax record with a sharp recording stylus. In 1885, when the Volta Associates were sure that they had a number of practical inventions, they filed patent applications and began to seek out investors. The Volta Graphophone Company of Alexandria, Virginia, was created on January 6, 1886 and incorporated on February 3, 1886. It was formed to control the patents and to handle the commercial development of their sound recording and reproduction inventions, one of which became the first Dictaphone. 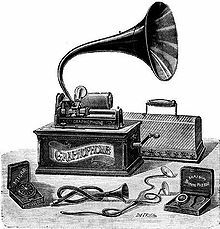 After the Volta Associates gave several demonstrations in the City of Washington, businessmen from Philadelphia created the American Graphophone Company on March 28, 1887, in order to produce and sell the machines for the budding phonograph marketplace. The Volta Graphophone Company then merged with American Graphophone, which itself later evolved into Columbia Records. Shortly after American Graphophone's creation, Jesse H. Lippincott used nearly $1 million of an inheritance to gain control of it, as well as the rights to the Graphophone and the Bell and Tainter patents. Not long later Lippincott purchased the Edison Speaking Phonograph Company. He then created the North American Phonograph Company to consolidate the national sales rights of both the Graphophone and the Edison Speaking Phonograph. In the early 1890s Lippincott fell victim to the unit's mechanical problems and also to resistance from stenographers. A coin-operated version of the Graphophone, U.S. Patent 506,348, was developed by Tainter in 1893 to compete with nickel-in-the-slot entertainment phonograph U.S. Patent 428,750 demonstrated in 1889 by Louis T. Glass, manager of the Pacific Phonograph Company. The work of the Volta Associates laid the foundation for the successful use of dictating machines in business, because their wax recording process was practical and their machines were durable. But it would take several more years and the renewed efforts of Edison and the further improvements of Emile Berliner and many others, before the recording industry became a major factor in home entertainment. Discs are not inherently better than cylinders at providing audio fidelity. Rather, the advantages of the format are seen in the manufacturing process: discs can be stamped; cylinders could not be until 1901–1902 when the gold moulding process was introduced by Edison. Recordings made on a cylinder remain at a constant linear velocity for the entirety of the recording, while those made on a disc have a higher linear velocity at the outer portion of the groove compared to the inner portion. Edison's patented recording method recorded with vertical modulations in a groove. Berliner utilized a laterally modulated groove. Though Edison's recording technology was better than Berliner's, there were commercial advantages to a disc system since the disc could be easily mass-produced by molding and stamping and it required less storage space for a collection of recordings. Berliner successfully argued that his technology was different enough from Edison's that he did not need to pay royalties on it, which reduced his business expenses. Through experimentation, in 1892 Berliner began commercial production of his disc records, and "gramophones" or "talking-machines". His "gramophone record" was the first disc record to be offered to the public. They were five inches (12.7 cm) in diameter and recorded on one side only. Seven-inch (17.5 cm) records followed in 1895. Also in 1895 Berliner replaced the hard rubber used to make the discs with a shellac compound. Berliner's early records had very poor sound quality, however. Work by Eldridge R. Johnson eventually improved the sound fidelity to a point where it was as good as the cylinder. By late 1901, ten-inch (25 cm) records were marketed by Johnson and Berliner's Victor Talking Machine Company, and Berliner had sold his interests. By 1908, a majority of the public demanded double-sided disc recordings, and cylinders fell into disfavor. Edison felt the increasing commercial pressure for disc records, and by 1912, though reluctant at first, his movement to disc records was in full swing. This was the Edison Disc Record. From the mid-1890s until World War I, both phonograph cylinder and disc recordings and machines to play them on were widely mass-marketed and sold. The disc system superseded the cylinder by 1912 and became more popular because of its cheaper price and better marketing by disc record companies. By 1913, Edison was the only company still producing cylinders. Edison continued to manufacture and sell cylinder records until quitting the record business entirely in November of 1929, and the history of disc and cylinder rivalry was concluded. Berliner's lateral disc record was the ancestor of the 78 rpm, 45 rpm, 33⅓ rpm, and all other analogue disc records popular for use in sound recording through the 20th century. See gramophone record. The 1920s brought improved radio technology and radio sales, bringing many phonograph dealers to near financial ruin. With efforts at improved audio fidelity, the big record companies succeeded in keeping business booming through the end of the decade, but the record sales plummeted during the Great Depression, with many companies merging or going out of business. Record sales picked up appreciably by the late 30s and early 40s, with greater improvements in fidelity and more money to be spent. By this time home phonographs had become much more common, though it wasn't until the 1940s that console radio/phono set-ups with automatic record changers became more common. In the 1930s, vinyl (originally known as vinylite) was introduced as a record material for radio transcription discs, and for radio commercials. At that time, virtually no discs for home use were made from this material. Vinyl was used for the popular 78-rpm V-discs issued to US soldiers during World War II. This significantly reduced breakage during transport. The first commercial vinylite record was the set of five 12" discs "Prince Igor" (Asch Records album S-800, dubbed from Soviet masters in 1945). Victor began selling some home-use vinyl 78s in late 1945; but most 78s were made of a shellac compound until the 78-rpm format was completely phased out. (Shellac records were heavier and more brittle.) 33s and 45s were, however, made exclusively of vinyl, with the exception of some 45s manufactured out of polystyrene. Booms in record sales returned after the Second World War, as industry standards changed from 78s to vinyl, long-playing records (commonly called record albums), which could contain an entire symphony, and 45s which usually contained one hit song popularized on the radio – thus the term "single" record – plus another song on the back or "flip" side. An "extended play" version of the 45 was also available, designated 45 EP, which provided capacity for longer musical selections, or for two regular-length songs per side. 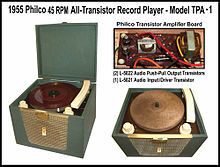 In 1955, Philco developed and produced the world's first all-transistor phonograph models TPA-1 and TPA-2, which were announced in the June 28, 1955 edition of the Wall Street Journal. Philco started to sell these all-transistor phonographs in the fall of 1955, for the price of $59.95. 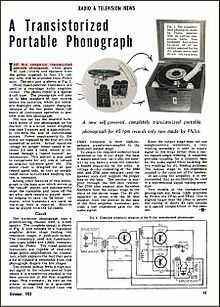 The October 1955 issue of Radio & Television News magazine (page 41), had a full page detailed article on Philco's new consumer product. The all-transistor portable phonograph TPA-1 and TPA-2 models played only 45rpm records and used four 1.5 volt "D" batteries for their power supply. The "TPA" stands for "Transistor Phonograph Amplifier". Their circuitry used three Philco germanium PNP alloy-fused junction audio frequency transistors. After the 1956 season had ended, Philco decided to discontinue both models, for transistors were too expensive compared to vacuum tubes, but by 1961 a $49.95 ($418.79 in 2018) portable, battery-powered radio-phonograph with seven transistors was available. By the 1960s, cheaper portable record players and record changers which played stacks of records in wooden console cabinets were popular, usually with heavy and crude tonearms in the portables. The consoles were often equipped with better quality pick-ups. Even pharmacies stocked 45 rpm records at their front counters. Rock music played on 45s became the soundtrack to the 1960s as people bought the same songs that were played free of charge on the radio. Some record players were even tried in automobiles, but were quickly displaced by 8-track and cassette tapes. High fidelity made great advances during the 1970s, as turntables became very precise instruments with belt or direct drive, jewel-balanced tonearms, some with electronically controlled linear tracking and magnetic cartridges. Some cartridges had frequency response above 30 kHz for use with CD-4 quadraphonic 4 channel sound. A high fidelity component system which cost under $1,000 could do a very good job of reproducing very accurate frequency response across the human audible spectrum from 20 Hz to 20,000 Hz with a $200 turntable which would typically have less than 0.05% wow and flutter and very low rumble (low frequency noise). A well-maintained record would have very little surface noise, though it was difficult to keep records completely free from scratches, which produced popping noises. Another characteristic failure mode was skipping, or groove lock, causing a section of music to repeat, separated by a popping noise. This was so common that a saying was coined: "you sound like a broken record", referring to someone who is being annoyingly repetitious. A novelty variation on the standard format was the use of multiple concentric spirals with different recordings. Thus when the record was played multiple times, different recordings would play, seemingly at random. Records themselves became an art form because of the large surface onto which graphics and books could be printed, and records could be molded into unusual shapes, colors, or with images (picture discs). The turntable remained a common element of home audio systems well after the introduction of other media, such as audio tape and even the early years of the compact disc as a lower-priced music format. However, even though the cost of producing CDs fell below that of records, CDs remained a higher-priced music format than either cassettes or records. Thus, records were not uncommon in home audio systems into the early 1990s. By the turn of the 21st century, the turntable had become a niche product, as the price of CD players, which reproduce music free of pops and scratches, fell far lower than high-fidelity tape players or turntables. Nevertheless, there is some increase in interest; many big-box media stores carry turntables, as do professional DJ equipment stores. Most low-end and mid-range amplifiers omit the phono input; but on the other hand, low-end turntables with built-in phono pre-amplifiers are widely available. Some combination systems include a basic turntable, a CD player, a cassette deck. and a radio, in a retro-styled cabinet. Records also continue to be manufactured and sold today, albeit in smaller quantities than in the disc phonograph's heyday. Inexpensive record players typically used a flanged steel stamping for the turntable structure. A rubber disc would be secured to the top of the stamping to provide traction for the record, as well as a small amount of vibration isolation. The spindle bearing usually consisted of a bronze bushing. The flange on the stamping provided a convenient place to drive the turntable by means of an idler wheel (see below). While light and cheap to manufacture, these mechanisms had low inertia, making motor speed instabilities more pronounced. Costlier turntables made from heavy aluminium castings have greater balanced mass and inertia, helping minimize vibration at the stylus, and maintaining constant speed without wow or flutter, even if the motor exhibits cogging effects. Like stamped steel turntables, they were topped with rubber. Because of the increased mass, they usually employed ball bearings or roller bearings in the spindle to reduce friction and noise. Most are belt or direct drive, but some use an idler wheel. A specific case was the Swiss "Lenco" drive, which possessed a very heavy turntable coupled via an idler wheel to a long, tapered motor drive shaft. This enabled stepless rotation or speed control on the drive. Because of this feature the Lenco became popular in the late 1950s with dancing schools, because the dancing instructor could lead the dancing exercises at different speeds. By the early 1980s, some companies started producing very inexpensive turntables that displaced the products of companies like BSR. Commonly found in "all-in-one" stereos from assorted far-east manufacturers, they used a thin plastic table set in a plastic plinth, no mats, belt drive, weak motors, and often, lightweight plastic tonearms with no counterweight. Most used sapphire pickups housed in ceramic cartridges, and they lacked several features of earlier units, such as auto-start and record-stacking. While not as common now that turntables are absent from the cheap "all-in-one" units, this type of turntable has made a strong resurgence in nostalgia-marketed record players. From the earliest phonograph designs, many of which were powered by spring-wound mechanisms, a speed governor was essential. Most of these employed some type of flywheel-friction disc to control the speed of the rotating cylinder or turntable; as the speed increased, centrifugal force caused a brake—often a felt pad—to rub against a smooth metal surface, slowing rotation. Electrically powered turntables, whose rotational speed was governed by other means, eventually made their mechanical counterparts obsolete. The mechanical governor was, however, still employed in some toy phonographs (such as those found in talking dolls) until they were replaced by digital sound generators in the late 20th century. Many modern players have platters with a continuous series of strobe markings machined or printed around their edge. Viewing these markings in artificial light at mains frequency produces a stroboscopic effect, which can be used to verify proper rotational speed. Additionally, the edge of the turntable can contain magnetic markings to provide feedback pulses to an electronic speed-control system. Earlier designs used a rubberized idler-wheel drive system. However, wear and decomposition of the wheel, as well as the direct mechanical coupling to a vibrating motor, introduced low-frequency noise ("rumble") and speed variations ("wow and flutter") into the sound. These systems generally used a synchronous motor which ran at a speed synchronized to the frequency of the AC power supply. Portable record players typically used an inexpensive shaded-pole motor. At the end of the motor shaft there was a stepped driving capstan; to obtain different speeds, the rubber idler wheel was moved to contact different steps of this capstan. The idler was pinched against the bottom or inside edge of the platter to drive it. Until the 1970s, the idler-wheel drive was the most common on turntables, except for higher-end audiophile models. However, even some higher-end turntables, such as the Lenco, Garrard, EMT, and Dual turntables, used idler-wheel drive. Belt drives brought improved motor and platter isolation compared to idler-wheel designs. Motor noise, generally heard as low-frequency rumble, is greatly reduced. The design of the belt drive turntable allows for a less expensive motor than the direct-drive turntable to be used. The elastomeric belt absorbs motor vibrations and noise which could otherwise be picked up by the stylus. It also absorbs small, fast speed variations, caused by "cogging", which in other designs are heard as "flutter." The "Acoustical professional" turntable (earlier marketed under Dutch "Jobo prof") of the 1960s however possessed an expensive German drive motor, the "Pabst Aussenläufer" ("Pabst outrunner"). As this motor name implied, the rotor was on the outside of the motor and acted as a flywheel ahead of the belt-driven turntable itself. In combination with a steel to nylon turntable bearing (with molybdenum disulfide inside for lifelong lubrication) very low wow, flutter and rumble figures were achieved. Direct-drive turntables drive the platter directly without utilizing intermediate wheels, belts, or gears as part of a drive train. The platter functions as a motor armature. This requires good engineering, with advanced electronics for acceleration and speed control. Matsushita's Technics division introduced the first commercially successful direct drive platter, model SP10, in 1969, which was joined by the Technics SL-1200 turntable, in 1972. Its updated model, SL-1200MK2, released in 1978, had a stronger motor, a convenient pitch control slider for beatmatching and a stylus illuminator, which made it the long-standing favourite among disc jockeys (see "Turntablism"). By the beginnings of the 80s, lowering of costs in microcontroller electronics made direct drive turntables more affordable. The evaluation of the "best" drive technology is not clear and more depending on the implementation than on the drive technology itself. Technical measurements show that similarly low flutter (0.025% WRMS) and rumble (−78 dB weighed) figures are possible for high quality turntables, be they belt drive or direct drive. Audiophile grade turntables start at a few hundred dollars and range upwards of $100,000, depending on the complexity and quality of design and manufacture. The common view is that there are diminishing returns with an increase in price – a turntable costing $1,000 would not sound significantly better than a turntable costing $500; nevertheless, there exists a large choice of expensive turntables. "Tonearm" redirects here. For the musician, see Tonearm (musician). The tone arm (or tonearm) holds the pickup cartridge over the groove, the stylus tracking the groove with the desired force to give the optimal compromise between good tracking and minimizing wear of the stylus and record groove. At its simplest, a tone arm is a pivoted lever, free to move in two axes (vertical and horizontal) with a counterbalance to maintain tracking pressure. Adjustable counterweight; the dial below is the anti-skating adjustment. The tone arm must track the groove without distorting the stylus assembly, so an ideal arm would have no mass, and frictionless bearings, requiring zero force to move it. The arm should not oscillate following a displacement, so it should either be both light and very stiff, or suitably damped. The arm must not resonate with vibrations induced by the stylus or from the turntable motor or plinth, so it must be heavy enough to be immune to those vibrations, or it must be damped to absorb them. The arm should keep the cartridge stylus tangent to the groove it's in as it moves across the record, with minimal variation in angle. These demands are contradictory and impossible to realize (massless arms and zero-friction bearings do not exist in the real world), so tone arm designs require engineering compromises. Solutions vary, but all modern tonearms are at least relatively lightweight and stiff constructions, with precision, very low friction pivot bearings in both the vertical and horizontal axes. Most arms are made from some kind of alloy (the cheapest being aluminium), but some manufacturers use balsa wood, while others use carbon fiber or graphite. The latter materials favor a straight arm design; alloys' properties lend themselves to S-type arms. The tone arm got its name before the age of electronics. It originally served to conduct actual sound waves from a purely mechanical "pickup" called a sound box or reproducer to a so-described "amplifying" horn. The earliest electronic record players, introduced at the end of 1925, had massive electromagnetic pickups that contained a horseshoe magnet, used disposable steel needles, and weighed several ounces. Their full weight rested on the record, providing ample tracking force to overcome their low compliance but causing rapid record wear. The tone arms were rudimentary and remained so even after lighter crystal pickups appeared about ten years later. When fine-grooved vinyl records were introduced in the late 1940s, still smaller and lighter crystal (later, ceramic) cartridges with semi-permanent jewel styluses became standard. In the mid-1950s these were joined by a new generation of magnetic cartridges that bore little resemblance to their crude ancestors. Far smaller tracking forces became possible and the balanced arm came into use. Prices varied widely. The well-known and extremely popular high-end S-type SME arm of the 1970–1980 era not only had a complicated design, it was also very costly. On the other hand, even some cheaper arms could be of professional quality: the "All Balance" arm, made by the now-defunct Dutch company Acoustical, was only €30 [equivalent]. It was used during that period by all official radio stations in the Dutch Broadcast studio facilities of the NOS, as well as by the pirate radio station Veronica. Playing records from a boat in international waters, the arm had to withstand sudden ship movements. Anecdotes indicate this low-cost arm was the only one capable of keeping the needle firmly in the groove during heavy storms at sea. Quality arms employ an adjustable counterweight to offset the mass of the arm and various cartridges and headshells. On this counterweight, a calibrated dial enables easy adjustment of stylus force. After perfectly balancing the arm, the dial itself is "zeroed"; the stylus force can then be dialed in by screwing the counterweight towards the fulcrum. (Sometimes a separate spring or smaller weight provides fine tuning.) Stylus forces of 10 to 20 mN (1 to 2 grams-force) are typical for modern consumer turntables, while forces of up to 50 mN (5 grams) are common for the tougher environmental demands of party deejaying or turntablism. Of special adjustment consideration, Stanton cartridges of the 681EE(E) series [and others like them] feature a small record brush ahead of the cartridge. The upforce of this brush, and its added drag require compensation of both tracking force (add 1 gram) and anti-skating adjustment values (see next paragraph for description). Even on a perfectly flat LP, tonearms are prone to two types of tracking errors that affect the sound. As the tonearm tracks the groove, the stylus exerts a frictional force tangent to the arc of the groove, and since this force does not intersect the tone arm pivot, a clockwise rotational force (moment) occurs and a reaction skating force is exerted on the stylus by the record groove wall away from center of the disc. Modern arms provide an anti-skate mechanism, using springs, hanging weights, or magnets to produce an offsetting counter-clockwise force at the pivot, making the net lateral force on the groove walls near zero. The second error occurs as the arm sweeps in an arc across the disc, causing the angle between the cartridge head and groove to change slightly. A change in angle, albeit small, will have a detrimental effect (especially with stereo recordings) by creating different forces on the two groove walls, as well as a slight timing shift between left/right channels. Making the arm longer to reduce this angle is a partial solution, but less than ideal. A longer arm weighs more, and only an infinitely long [pivoted] arm would reduce the error to zero. Some designs (Burne-Jones, and Garrard "Zero" series) use dual arms in a parallelogram arrangement, pivoting the cartridge head to maintain a constant angle as it moves across the record. Unfortunately this "solution" creates more problems than it solves, compromising rigidity and creating sources of unwanted noise. The pivoted arm produces yet another problem which is unlikely to be significant to the audiophile, though. As the master was originally cut in a linear motion from the edge towards the center, but the stylus on the pivoted arm always draws an arc, this causes a timing drift that is most significant when digitizing music and beat mapping the data for synchronization with other songs in a DAW or DJ software unless the software allows building a non-linear beat map. As the contact point of the stylus on the record wanders farther from the linear path between the starting point and center hole, the tempo and pitch tend to decrease towards the middle of the record, until the arc reaches its apex. After that the tempo and pitch increase towards the end as the contact point comes closer to the linear path again. Because the surface speed of the record is lower at the end, the relative speed error from the same absolute distance error is higher at the end, and the increase in tempo is more notable towards the end than the decrease towards the middle. This can be somewhat reduced by a curved arm pivoted so that the end point of the arc stays farther from the linear path than the starting point, or by a long straight arm that pivots perpendicularly to the linear path in the middle of the record. However the tempo droop at the middle can only be completely avoided by a linear tracking arm. If the arm is not pivoted, but instead carries the stylus along a radius of the disc, there is no skating force and little to no cartridge angle error. Such arms are known as linear tracking or tangential arms. These are driven along a track by various means, from strings and pulleys, to worm gears or electromagnets. The cartridge's position is usually regulated by an electronic servomechanism or mechanical interface, moving the stylus properly over the groove as the record plays, or for song selection. There are long-armed and short-armed linear arm designs. On a perfectly flat record a short arm will do, but once the record is even slightly warped, a short arm will be troublesome. Any vertical motion of the record surface at the stylus contact point will cause the stylus to considerably move longitudinally in the groove. This will cause the stylus to ride non-tangentially in the groove and cause a stereo phase error as well as pitch error every time the stylus rides over the warp. Also the arm track can come into touch with the record. A long arm will not completely eliminate this problem but will tolerate warped records much better. Early developments in linear turntables were from Rek-O-Kut (portable lathe/phonograph) and Ortho-Sonic in the 1950s, and Acoustical in the early 1960s. These were eclipsed by more successful implementations of the concept from the late 1960s through the early 1980s. Of note are Rabco's SL-8, followed by Bang & Olufsen with its Beogram 4000 model in 1972. These models positioned the track outside the platter's edge, as did turntables by Harman Kardon, Mitsubishi, Pioneer, Yamaha, Sony, etc. A 1970s design from Revox harkened back to the 1950s attempts (and, record lathes), positioning the track directly over the record. An enclosed bridge-like assembly is swung into place from the platter's right edge to its middle. Once in place, a short tonearm under this "bridge" plays the record, driven across laterally by a motor. The Sony PS-F5/F9 (1983) uses a similar, miniaturized design, and can operate in a vertical or horizontal orientation. The Technics SL-10, introduced in 1981, was the first direct drive linear tracking turntable, and placed the track and arm on the underside of the rear-hinged dust cover, to fold down over the record, similar to the SL-Q6 pictured. The earliest Edison phonographs used horizontal, spring-powered drives to carry the stylus across the recording at a pre-determined rate. But, historically as a whole, the linear tracking systems never gained wide acceptance, due largely to their complexity and associated production/development costs. The resources it takes to produce one incredible linear turntable could produce several excellent ones. Some of the most sophisticated and expensive tonearms and turntable units ever made are linear trackers, from companies such as Rockport and Clearaudio. In theory, it seems nearly ideal; a stylus replicating the motion of the recording lathe used to cut the "master" record could result in minimal wear and maximum sound reproduction. In practice, in vinyl's heyday it was generally too much too late. Since the early 1980s, an elegant solution has been the near-frictionless air bearing linear arm that requires no tracking drive mechanism other than the record groove. This provides a similar benefit as the electronic linear tonearm without the complexity and necessity of servo-motor correction for tracking error. In this case the trade-off is the introduction of pneumatics in the form of audible pumps and tubing. A more elegant solution is the mechanically driven low-friction design, also driven by the groove. Examples include Souther Engineering (U.S.A.), Clearaudio (Germany), and Aura (Czech Republic). This design places an exceeding demand upon precision engineering due to the lack of pneumatics. Historically, most high-fidelity "component" systems (preamplifiers or receivers) that accepted input from a phonograph turntable had separate inputs for both ceramic and magnetic cartridges (typically labeled "CER" and "MAG"). One piece systems often had no additional phono inputs at all, regardless of type. Most systems today, if they accept input from a turntable at all, are configured for use only with magnetic cartridges. Manufacturers of high-end systems often have in-built moving coil amplifier circuitry, or outboard head-amplifiers supporting either moving magnet or moving coil cartridges that can be plugged into the line stage. Early electronic phonographs used a piezo-electric crystal for pickup (though the earliest electronic phonographs used crude magnetic pick-ups), where the mechanical movement of the stylus in the groove generates a proportional electrical voltage by creating stress within a crystal (typically Rochelle salt). Crystal pickups are relatively robust, and produce a substantial signal level which requires only a modest amount of further amplification. The output is not very linear however, introducing unwanted distortion. It is difficult to make a crystal pickup suitable for quality stereo reproduction, as the stiff coupling between the crystal and the long stylus prevents close tracking of the needle to the groove modulations. This tends to increase wear on the record, and introduces more distortion. Another problem is the hygroscopic nature of the crystal itself: it absorbs moisture from the air and may dissolve. The crystal was protected by embedding it in other materials, without hindering the movement of the pickup mechanism itself. After a number of years, the protective jelly often deteriorated or leaked from the cartridge case and the full unit needed replacement. The next development was the ceramic cartridge, a piezoelectric device that used newer, and better, materials. These were more sensitive, and offered greater compliance, that is, lack of resistance to movement and so increased ability to follow the undulations of the groove without gross distorting or jumping out of the groove. Higher compliance meant lower tracking forces and reduced wear to both the disc and stylus. It also allowed ceramic stereo cartridges to be made. During the 1950s to 1970s, ceramic cartridge became common in low quality phonographs, but better high-fidelity (or "hi-fi") systems used magnetic cartridges, and the availability of low cost magnetic cartridges from the 1970s onwards made ceramic cartridges obsolete for essentially all purposes. At the seeming end of the market lifespan of ceramic cartridges, someone accidentally discovered that by terminating a specific ceramic mono cartridge (the Ronette TX88) not with the prescribed 47 kΩ resistance, but with approx. 10 kΩ, it could be connected to the moving magnet (MM) input too. The result, a much smoother frequency curve extended the lifetime for this popular and very cheap type. Another popular ceramic stereo cartridge was the Audio Technica model AT66, which because of its price performance ratio was favoured by many as an alternative to more expensive magnetic cartridges. There are two common designs for magnetic cartridges, moving magnet (MM) and moving coil (MC) (originally called dynamic). Both operate on the same physics principle of electromagnetic induction. The moving magnet type was by far the most common and more robust of the two, though audiophiles often claim that the moving coil system yields higher fidelity sound. In either type, the stylus itself, usually of diamond, is mounted on a tiny metal strut called a cantilever, which is suspended using a collar of highly compliant plastic. This gives the stylus the freedom to move in any direction. On the other end of the cantilever is mounted a tiny permanent magnet (moving magnet type) or a set of tiny wound coils (moving coil type). The magnet is close to a set of fixed pick-up coils, or the moving coils are held within a magnetic field generated by fixed permanent magnets. In either case, the movement of the stylus as it tracks the grooves of a record causes a fluctuating magnetic field, which causes a small electric current to be induced in the coils. This current closely follows the sound waveform cut into the record, and may be transmitted by wires to an electronic amplifier where it is processed and amplified in order to drive a loudspeaker. Depending upon the amplifier design, a phono-preamplifier may be necessary. In most moving magnet designs, the stylus itself is detachable from the rest of the cartridge so it can easily be replaced. There are three primary types of cartridge mounts. The most common type is attached using two small screws to a headshell that then plugs into the tonearm, while another is a standardized "P-mount" or "T4P" cartridge (invented by Technics in 1980 and adopted by other manufacturers) that plugs directly into the tonearm. Many P-mount cartridges come with adapters to allow them to be mounted to a headshell. The third type is used mainly in cartridges designed for DJ use and it has a standard round headshell connector. Some mass market turntables use a proprietary integrated cartridge that cannot be upgraded. An alternative design is the moving iron variation on moving magnet used by ADC, Grado, Stanton/Pickering 681 series, Ortofon OM and VMS series, and the MMC cartridge of Bang & Olufsen. In these units, the magnet itself sits behind the four coils and magnetises the cores of all four coils. The moving iron cross at the other end of the coils varies the gaps between itself and each of these cores, according to its movements. These variations lead to voltage variations as described above. Famous brands for magnetic cartridges are: Grado, Stanton/Pickering (681EE/EEE), B&O (MM types for its two, non-compatible generations of parallel arm design), Shure (V15 Type I to V), Audio-Technica, Nagaoka, Dynavector, Koetsu, Ortofon, Technics, Denon and ADC. Strain gauge or "semiconductor" cartridges do not generate a voltage, but act like a variable resistor, whose resistance directly depends on the movement of the stylus. Thus, the cartridge "modulates" an external voltage supplied by the (special) preamplifier. These pickups were marketed by Euphonics, Sao Win, and Panasonic/Technics, amongst others. The electrical connection from the cartridge to the preamplifier is immune to cable capacitance issues. Being non-magnetic, the cartridge is immune to "hum" induced by stray magnetic fields (same advantage shared with ceramic cartridges). The combination of electrical and mechanical advantages, plus the absence of magnetic yoke high-frequency losses, make them especially suitable to reproducing frequencies up to 50 kHz. Technics (Matsushita Electric) marketed a line of strain-gauge (labeled "semiconductor") cartridges especially intended for Compatible Discrete 4 quadraphonic records, requiring such high frequency response. Bass response down to 0 Hz is possible. By using a suitable mechanical arrangement, VTA (vertical tracking angle) stays steady independent of the stylus vertical movements, with the consequent reduction in related distortions. Being a force sensor, the strain-gauge cartridge can also measure the actual VTF (vertical tracking force) while in use. The main disadvantage is the need of a special preamplifier that supplies a steady current (typically 5mA) to the semiconductor elements and handles a special equalization than the one needed for magnetic cartridges. A high-end strain-gauge cartridge is currently sold by an audiophile company, with special preamplifiers available. Electrostatic cartridges were marketed by Stax in the 1950 and 1960 years. They needed individual operating electronics or preamplifiers. A few specialist laser turntables read the groove optically using a laser pickup. Since there is no physical contact with the record, no wear is incurred. However, this "no wear" advantage is debatable, since vinyl records have been tested to withstand even 1200 plays with no significant audio degradation, provided that it is played with a high quality cartridge and that the surfaces are clean. An alternative approach is to take a high-resolution photograph or scan of each side of the record and interpret the image of the grooves using computer software. An amateur attempt using a flatbed scanner lacked satisfactory fidelity. A professional system employed by the Library of Congress produces excellent quality. A smooth-tipped stylus (in popular usage often called a needle due to the former use of steel needles for the purpose) is used to play the recorded groove. A special chisel-like stylus is used to engrave the groove into the master record. The stylus is subject to hard wear as it is the only small part that comes into direct contact with the spinning record. In terms of the pressure imposed on its minute areas of actual contact, the forces it must bear are enormous. There are three desired qualities in a stylus: first, that it faithfully follows the contours of the recorded groove and transmits its vibrations to the next part in the chain; second, that it does not damage the recorded disc; and third, that it is resistant to wear. A worn-out, damaged or defective stylus tip will degrade audio quality and injure the groove. Different materials for the stylus have been used over time. Thomas Edison introduced the use of sapphire in 1892 and the use of diamond in 1910 for his cylinder phonographs. The Edison Diamond Disc players (1912–1929), when properly played, hardly ever required the stylus to be changed. The styli for vinyl records were also made out of sapphire or diamond. A specific case is the specific stylus type of Bang & Olufsen's (B&O) moving magnet cartridge MMC 20CL, mostly used in parallel arm B&O turntables in the 4002/6000 series. It uses a sapphire stem on which a diamond tip is fixed by a special adhesive. A stylus tip mass as low as 0.3 milligram is the result and full tracking only requires 1 gram of stylus force, reducing record wear even further. Maximum distortion (2nd harmonic) fell below 0.6%. Other than the Edison and European Pathé disc machines, early disc players, both external horn and internal horn "Victrola" style models, normally used very short-lived disposable needles. The most common material was steel, although other materials such as copper, tungsten, bamboo and cactus were used. Steel needles needed to be replaced frequently, preferably after each use, due to their very rapid wear from bearing down heavily on the mildly abrasive shellac record. Rapid wear was an essential feature so that their imprecisely formed tips would be quickly worn into compliance with the groove's contours. Advertisements implored customers to replace their steel needles after each record side. Steel needles were inexpensive, e.g., a box of 500 for 50 US cents, and were widely sold in packets and small tins. They were available in different thicknesses and lengths. Thick, short needles produced strong, loud tones while thinner, longer needles produces softer, muted tones. In 1916, in the face of a wartime steel shortage, Victor introduced their "Tungs-Tone" brand extra-long-playing needle, which was advertised to play between 100 and 300 records. It consisted of a brass shank into which a very hard and strong tungsten wire, somewhat narrower than the standard record groove, had been fitted. The protruding wire wore down, but not out, until it was worn too short to use. Later in the 78 rpm era, hardened steel and chrome-plated needles came on the market, some of which were claimed to play 10 to 20 record sides each. When sapphires were introduced for the 78 rpm disc and the LP, they were made by tapering a stem and polishing the tip to a sphere with a radius of around 70 and 25 micrometers respectively. A sphere is not equal to the form of the cutting stylus and by the time diamond needles came to the market, a whole discussion was started on the effect of circular forms moving through a non-circular cut groove. It can be easily shown that vertical, so called "pinching" movements were a result and when stereophonic LPs were introduced, unwanted vertical modulation was recognized as a problem. Also, the needle started its life touching the groove on a very small surface, giving extra wear on the walls. Cross-section diagram comparing two common types of stylus. Spherical (left), Elliptical (right). Note the difference in contact area marked in red. The elliptical stylus allows for more groove contact area, which increases fidelity, whereas the spherical makes less contact with the groove and generates less fidelity. Another problem is in the tapering along a straight line, while the side of the groove is far from straight. Both problems were attacked together: by polishing the diamond in a certain way that it could be made doubly elliptic. 1) the side was made into one ellipse as seen from behind, meaning the groove touched along a short line and 2) the ellipse form was also polished as seen from above and curvature in the direction of the groove became much smaller than 25 micrometers e.g. 13 micrometers. With this approach a number of irregularities were eliminated. Furthermore, the angle of the stylus, which used to be always sloping backwards, was changed into the forward direction, in line with the slope the original cutting stylus possessed. These styli were expensive to produce, but the costs were effectively offset by their extended lifespans. The next development in stylus form came about by the attention to the CD-4 quadraphonic sound modulation process, which requires up to 50 kHz frequency response, with cartridges like Technics EPC-100CMK4 capable of playback on frequencies up to 100 kHz. This requires a stylus with a narrow side radius, such as 5 µm (or 0.2 mil). A narrow-profile elliptical stylus is able to read the higher frequencies (greater than 20 kHz), but at an increased wear, since the contact surface is narrower. For overcoming this problem, the Shibata stylus was invented around 1972 in Japan by Norio Shibata of JVC, fitted as standard on quadraphonic cartridges, and marketed as an extra on some high-end cartridges. The Shibata-designed stylus offers a greater contact surface with the groove, which in turn means less pressure over the vinyl surface and thus less wear. A positive side effect is that the greater contact surface also means the stylus will read sections of the vinyl that were not touched (or "worn") by the common spherical stylus. In a demonstration by JVC  records "worn" after 500 plays at a relatively very high 4.5 gf tracking force with a spherical stylus, played "as new" with the Shibata profile. Other advanced stylus shapes appeared following the same goal of increasing contact surface, improving on the Shibata. Chronologically: "Hughes" Shibata variant (1975), "Ogura" (1978), Van den Hul (1982). Such a stylus may be marketed as "Hyperelliptical" (Shure), "Alliptic", "Fine Line" (Ortofon), "Line contact" (Audio Technica), "Polyhedron", "LAC", or "Stereohedron" (Stanton). A keel-shaped diamond stylus appeared as a byproduct of the invention of the CED Videodisc. This, together with laser-diamond-cutting technologies, made possible the "ridge" shaped stylus, such as the Namiki (1985) design, and Fritz Gyger (1989) design. This type of stylus is marketed as "MicroLine" (Audio technica), "Micro-Ridge" (Shure), or "Replicant" (Ortofon). It is important to point out that most of those stylus profiles are still being manufactured and sold, together with the more common spherical and elliptical profiles. This is despite the fact that production of CD-4 quadraphonic records ended by the late 1970s. Early materials in the 19th century were hardened rubber, wax, and celluloid, but early in the 20th century a shellac compound became the standard. Since shellac is not hard enough to withstand the wear of steel needles on heavy tone arms, filler made of pulverized shale was added. Shellac was also fragile, and records often shattered or cracked. This was a problem for home records, but it became a bigger problem in the late 1920s with the Vitaphone sound-on-disc motion picture "talkie" system, developed in 1927. To solve this problem, in 1930, RCA Victor made unbreakable records by mixing polyvinyl chloride with plasticisers, in a proprietary formula they called Victrolac, which was first used in 1931, in motion picture discs, and experimentally, in home records, the same year. However, with Sound-on-film achieving supremacy over sound-on-disc by 1931, the need for unbreakable records diminished and the production of vinyl home recordings was dropped as well, for the time being. The Victrolac formula improved throughout the 1930s, and by the late 30s the material, by then called vinylite, was being used in records sent to radio stations for radio program records, radio commercials, and later, DJ copies of phonograph records, because vinyl records could be sent through the mail to radio stations without breaking. During WWII, there was a shortage of shellac, which had to be imported from Asia, and the U.S. government banned production of shellac records for the duration of the war. Vinylite was made domestically, though, and was being used for V-discs during the war. Record company engineers took a much closer look at the possibilities of vinyl, possibly that it might even replace shellac as the basic record material. After the war, RCA Victor and Columbia, by far the two leading records companies in America, perfected two new vinyl formats, which were both introduced in 1948, when the 33​1⁄3 RPM LP was introduced by Columbia and the 45 RPM single was introduced by RCA Victor. For a few years thereafter, however, 78 RPM records continued to be made in shellac until that format was phased out around 1958. The energy needed to generate such sound levels as were obtainable had to come directly from the stylus tracing the groove. This required very high tracking forces that rapidly wore out both the stylus and the record on lateral cut 78 rpm records. Because bass sounds have a higher amplitude than high frequency sounds (for the same perceived loudness), the space taken in the groove by low frequency sounds needed to be large (limiting playback time per side of the record) to accommodate the bass notes, yet the high frequencies required only tiny variations in the groove, which were easily affected by noise from irregularities (wear, contaminates, etc.) in the disc itself. The introduction of electronic amplification allowed these issues to be addressed. Records are made with boosted high frequencies and reduced low frequencies, which allow for different ranges of sound to be produced. This reduces the effect of background noise, including clicks or pops, and also conserves the amount of physical space needed for each groove, by reducing the size of the low-frequency undulations. During playback, the high frequencies must be rescaled to their original, flat frequency response—known as "equalization"—as well as being amplified. A phono input of an amplifier incorporates such equalization as well as amplification to suit the very low level output from a modern cartridge. Most hi-fi amplifiers made between the 1950s and the 1990s and virtually all DJ mixers are so equipped. The widespread adoption of digital music formats, such as CD or satellite radio, has displaced phonograph records and resulted in phono inputs being omitted in most modern amplifiers. Some newer turntables include built-in preamplifiers to produce line-level outputs. Inexpensive and moderate performance discrete phono preamplifiers with RIAA equalization are available, while high-end audiophile units costing thousands of dollars continue to be available in very small numbers. Phono inputs are starting to reappear on amplifiers in the 2010s due to the vinyl revival. Since the late 1950s, almost all phono input stages have used the RIAA equalization standard. Before settling on that standard, there were many different equalizations in use, including EMI, HMV, Columbia, Decca FFRR, NAB, Ortho, BBC transcription, etc. Recordings made using these other equalization schemes will typically sound odd if they are played through a RIAA-equalized preamplifier. High-performance (so-called "multicurve disc") preamplifiers, which include multiple, selectable equalizations, are no longer commonly available. However, some vintage preamplifiers, such as the LEAK varislope series, are still obtainable and can be refurbished. Newer preamplifiers like the Esoteric Sound Re-Equalizer or the K-A-B MK2 Vintage Signal Processor are also available. These kinds of adjustable phono equalizers are used by consumers wishing to play vintage record collections (often the only available recordings of musicians of the time) with the equalization used to make them. Turntables continue to be manufactured and sold in the 2010s, although in small numbers. While some audiophiles still prefer the sound of vinyl records over that of digital music sources (mainly compact discs), they represent a minority of listeners. As of 2015 the sale of vinyl LP's has increased 49–50% percent from the previous year although small in comparison to the sale of other formats which although more units were sold (Digital Sales, CDs) the more modern formats experienced a decline in sales. The quality of available record players, tonearms, and cartridges has continued to improve, despite diminishing demand, allowing turntables to remain competitive in the high-end audio market. Vinyl enthusiasts are often committed to the refurbishment and sometimes tweaking of vintage systems. The chart on the right illustrates that users of one enthusiasts' forum post as many pictures of discontinued gear as they do of current models. Updated versions of the 1970s era Technics SL-1200 (production ceased in 2010) have remained an industry standard for DJs to the present day. Turntables and vinyl records remain popular in mixing (mostly dance-oriented) forms of electronic music, where they allow great latitude for physical manipulation of the music by the DJ. In hip hop music and occasionally in other genres, the turntable is used as a musical instrument by DJs, who use turntables along with a DJ mixer to create unique rhythmic sounds. Manipulation of a record as part of the music, rather than for normal playback or mixing, is called turntablism. The basis of turntablism, and its best known technique, is scratching, pioneered by Grand Wizzard Theodore. It was not until Herbie Hancock's "Rockit" in 1983 that the turntablism movement was recognized in popular music outside of a hip hop context. In the 2010s, many hip hop DJs use DJ CD players or digital record emulator devices to create scratching sounds; nevertheless, some DJs still scratch with vinyl records. The laser turntable uses a laser as the pickup instead of a stylus in physical contact with the disk. It was conceived of in the late 1980s, although early prototypes were not of usable audio quality. Practical laser turntables are now being manufactured by ELPJ. They are favoured by record libraries and some audiophiles since they eliminate physical wear completely. Experimentation is in progress in retrieving the audio from old records by scanning the disc and analysing the scanned image, rather than using any sort of turntable. Although largely replaced since the introduction of the compact disc in 1982, record albums still sell in small numbers and are available through numerous sources. In 2008, LP sales grew by 90% over 2007, with 1.9 million records sold. USB turntables have a built-in audio interface, which transfers the sound directly to the connected computer. Some USB turntables transfer the audio without equalization, but are sold with software that allows the EQ of the transferred audio file to be adjusted. There are also many turntables on the market designed to be plugged into a computer via a USB port for needle dropping purposes. Responding to longtime calls by fans and disc jockeys, Panasonic Corp. said it is reviving Technics turntables–the series that remains a de facto standard player supporting nightclub music scenes. The new analog turntable, which would come with new direct-drive motor technologies that Panasonic says would improve the quality of sound, would be released sometime between April 2016 and March 2017, the Japanese electronics company announced on September 2, 2015. ^ "Tinfoil Phonograph". Rutgers University. Archived from the original on 2011-05-13. ^ "History of the Cylinder Phonograph". Library of Congress. ^ "The Biography of Thomas Edison". Gerald Beals. Archived from the original on 2011-09-03. ^ Names "record player" and "turntable" have gradually become synonymous, however the second one is more associatednwith devices requiring separate amplifiers and loudspeakers. Originally, the term "turntable" referred to the part of phonograph's mechanism providing rotation of the record. ^ "Application by the Gramophone Company to register "Gramophone" as a trade mark" (PDF). Reports of Patent, Design and Trade Mark Cases. The Illustrated Official Journal. 1910-07-05. ^ "Origins of Sound Recording: The Inventors". www.nps.gov. 2017. Archived from the original on 2017-09-21. ^ "FirstSounds.org". FirstSounds.org. 2010-04-09. Archived from the original on 2011-10-08. Retrieved 2011-10-12. ^ Jody Rosen (March 27, 2008). "Researchers Play Tune Recorded Before Edison". New York Times. Archived from the original on July 1, 2017. ^ "www.phonozoic.net". Transcription and translation of October 10, 1877 article on Cros "phonographe". Archived from the original on July 24, 2011. ^ "www.phonozoic.net". Transcription and translation of December 3, 1877 unsealing of April, 1877 Cros deposit. Archived from the original on July 24, 2011. ^ "Charles Cros | French inventor and poet". Encyclopedia Britannica. Retrieved 2018-03-09. ^ Patrick Feaster, "Speech Acoustics and the Keyboard Telephone: Rethinking Edison's Discovery of the Phonograph Principle," ARSC Journal 38:1 (Spring 2007), 10–43; Oliver Berliner and Patrick Feaster, "Letters to the Editor: Rethinking Edison's Discovery of the Phonograph Principle," ARSC Journal 38:2 (Fall 2007), 226–228. ^ Dubey, N. B. (2009). Office Management: Developing Skills for Smooth Functioning. p. 139. Retrieved 22 March 2019. ^ Klein, Herman (1990). William R. Moran (ed.). Herman Klein and The Gramophone. Amadeus Press. p. 380. ISBN 0-931340-18-7. ^ "Article about Edison and the invention of the phonograph". Memory.loc.gov. Archived from the original on 2016-08-19. Retrieved 2016-08-15. ^ Ironically, Berliner's first patent, US 372,786, illustrated the use of his technique on a cylinder. ^ University of California. Cylinder Preservation and Digitization Project: George W. Washington Archived 2011-06-29 at the Wayback Machine, Department of Special Collections, Donald C. Davidson Library, University of California at Santa Barbara. ^ Aaron Cramer, Tim Fabrizio, and George Paul, "A Dialogue on 'The Oldest Playable Recording,'" ARSC Journal 33:1 (Spring 2002), 77–84; Patrick Feaster and Stephan Puille, "Dialogue on 'The Oldest Playable Recording' (continued), ARSC Journal 33:2 (Fall 2002), 237–242. ^ Rosen, Jody (2008-03-27). "Researchers Play Tune Recorded Before Edison". Nytimes.com. Archived from the original on 2011-09-03. Retrieved 2011-10-12. ^ Eichler, Jeremy (6 April 2014). "Technology saves echoes of past from silence". The Boston Globe. Archived from the original on 7 April 2014. Retrieved 7 April 2014. ^ Matthew Rubery, ed. (2011). "Introduction". Audiobooks, Literature, and Sound Studies. Routledge. pp. 1–21. ISBN 978-0-415-88352-8. ^ Thomas Edison. "Mary had a little lamb". Archived from the original on 2016-10-03 – via Internet Archive. ^ a b c d e f g h Newville, Leslie J. Development of the Phonograph at Alexander Graham Bell's Volta Laboratory Archived 2011-06-04 at the Wayback Machine, United States National Museum Bulletin, United States National Museum and the Museum of History and Technology, Washington, D.C., 1959, No. 218, Paper 5, pp.69–79. Retrieved from ProjectGutenberg.org. ^ The Washington Herald, October 28, 1937. ^ Schoenherr, Steven. Recording Technology History: Charles Sumner Tainter and the Graphophone Archived 2011-12-23 at the Wayback Machine, originally published at the History Department of, University of San Diego, revised July 6, 2005. Retrieved from University of San Diego History Department website December 19, 2009. Document transferred to a personal website upon Professor Schoenherr's retirement. Retrieved again from homepage.mac.com/oldtownman website July 21, 2010. ^ Encyclopedia of World Biography. "Alexander Graham Bell Archived 2010-01-05 at the Wayback Machine", Encyclopedia of World Biography. Thomson Gale. 2004. Retrieved December 20, 2009 from Encyclopedia.com. ^ "cylinder history". Archived from the original on 9 December 2012. Retrieved 17 June 2012. ^ "the early gramophone". Archived from the original on 13 January 2012. Retrieved 17 June 2012. ^ Wallace, Robert (November 17, 1952). "First It Said 'Mary'". LIFE: 87–102. Archived from the original on March 6, 2017. ^ Wall Street Journal, "Phonograph Operated On Transistors to Be Sold by Philco Corp.", June 28, 1955, page 8. ^ "TPA-1 M32 R-Player Philco, Philadelphia Stg. Batt. Co.; USA" (in German). Radiomuseum.org. 1955-06-28. Archived from the original on 2013-10-21. Retrieved 2013-10-21. ^ "The Philco Radio Gallery – 1956". Philcoradio.com. 2012-03-12. Archived from the original on 2013-06-21. Retrieved 2013-10-21. ^ "/mode/2up "The Only Portable of its Kind!". If (advertisement). November 1961. p. Back cover. ^ Rudolf A. Bruil (2004-01-08). "Rabco SL-8E SL-8: Tangential Tonearm, Servo Control, Parallel Tracking, Functioning, Drawings, Construction, Manual". Soundfountain.com. Archived from the original on 2011-10-17. Retrieved 2011-10-12. ^ "Johana.com" (PDF). Archived from the original (PDF) on 2011-07-13. Retrieved 2011-10-12. ^ a b "Vinylengine.com". Vinylengine.com. 2009-11-09. Archived from the original on 2011-07-17. Retrieved 2011-10-12. ^ McIntyre, Hugh. "Vinyl Sales Grew More Than 50% In 2014". Archived from the original on 2017-07-29. ^ Martens, Todd (11 June 2009). "Vinyl sales to hit another high point in 2009". Los Angeles Times Music Blog. Archived from the original on 26 April 2013. Retrieved 4 June 2013. ^ "Vinyl to USB Conversion". recordplayerreviews.org. Archived from the original on 2016-07-30. ^ "USB turntable comparison". Knowzy.com. 2008-12-01. Archived from the original on 2011-07-13. Retrieved 2011-10-12. ^ "Panasonic to Revive Technics Turntables". Wall Street Journal. 2015-09-02. Archived from the original on 2015-09-04. Retrieved 2015-09-02. Brady, Erika. "A Spiral Way: How the Phonograph Changed Ethnography." Jackson: University Press of Mississippi, 1999. Bruil, Rudolf A. (January 8, 2004). "Linear Tonearms" Retrieved on July 25, 2011. Heumann, Michael. "Metal Machine Music: The Phonograph's Voice and the Transformation of Writing." eContact! 14.3 — Turntablism (January 2013). Montréal: CEC. Koenigsberg, Allen. The Patent History of the Phonograph, 1877–1912. APM Press, 1991. Reddie, Lovell N. (1908). "The Gramophone And The Mechanical Recording And Reproduction Of Musical Sounds". Annual Report of the Board of Regents of the Smithsonian Institution: 209–231. Retrieved 2009-08-07. Various. "Turntable [wiki]: Bibliography." eContact! 14.3 — Turntablism (January 2013). Montréal: CEC. Weissenbrunner, Karin. "Experimental Turntablism: Historical overview of experiments with record players / records — or Scratches from Second-Hand Technology." eContact! 14.3 — Turntablism (January 2013). Montréal: CEC. Cylinder Preservation & Digitization Project – Over 6,000 cylinder recordings held by the Department of Special Collections, University of California, Santa Barbara, free for download or streamed online. Cylinder players held at the British Library – information and high-quality images. Mario Frazzetto's Phonograph and Gramophone Gallery. This page is based on the Wikipedia article Phonograph; it is used under the Creative Commons Attribution-ShareAlike 3.0 Unported License (CC-BY-SA). You may redistribute it, verbatim or modified, providing that you comply with the terms of the CC-BY-SA.